Mezzo Soprano Elisha Fa’i Hulton told the Saturday night audience at Opera in Rarotonga that it was the mezzo sopranos who got all of the ‘witch parts’ in opera while the supposedly more exulted sopranos played princess roles. There must be some truth in that because she set about bewitching the audience at the Crown Beach Resort on Saturday night and finished her show to a standing ovation. Her repertoire was a clever mix of songs from musicals, a couple of saucy numbers from Carmen and a haunting beautiful Ave Maria. It also included some Maori and Island music as well as a great cover of Leonard Cohen’s Hallelujah with aspiring tenor Ridge Ponini and we’ll known local muso Tani Mussel. 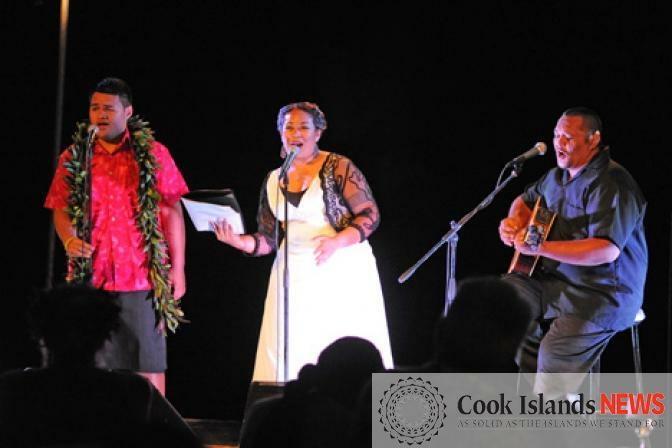 In her introduction, Motone Productions’ Glenda Tuaine said Elisha had been a real hit with her first visit to Aitutaki where she performed for about 50 people at a house concert and also conducted a workshop at Araura College. Later she told the audience that the trio of Elisha, Ridge and Tani had met for the first time that day at midday to rehearse what was a seamless performance. Glenda reminded the audience that Elisha is a semi-finalist in the prestigious Lexus Song Quest in New Zealand and she expected everyone in the audience to vote for Elisha in the People’s Choice award. Elisha can be heard in one of four special programmes on Radio New Zealand Concert at 4 pm this Thursday, June 5, when she sings four pieces. Other semi-finalists will have their turn on Saturday June 7 and Thursday June 12, both at 4pm, On Saturday 14 June at 4pm the six finalists will be announced. If you want to support Elisha, you can also vote for your favourite young singer in the Radio New Zealand Concert Listener’s Choice Award – voting will open onhttp://www.radionz.co.nz/concert/programmes/lexussongquest after the first broadcast on June 5.